Air-popped, microwaved, stovetop-popped, or Whirley-Popped? We taste-tested all four methods to find the ultimate way to make popcorn at home. Whenever I hear the faint sound of coughing and wheezing coming from the Serious Eats bullpen, I instantly know that the team has just popped a fresh batch of Kim Chee Hurricane Popcorn. It’s the latest obsession at the office—a Hawaiian microwave popcorn loaded with crispy mochi bits, savory nori strips, and a kick of chili that goes straight to your sinuses. Everyone loves it so much, they sneeze their way through bag after bag with pleasure. It’s no secret we’ve got a thing for popcorn; the team can’t stop finding reasons to develop more variations. Daniel brought an Italian twist to this American classic with anchovies, garlic, and olive oil in his bagna càuda popcorn, while Stella explored popcorn’s sweet side with her candy-coated crispy chocolate popcorn. My personal popcorn intake has recently reached such an all-time high that I’ve had to cut myself off—cold turkey. It’s all because of an air popper that found its way into my kitchen, making it dangerously simple to pop bowl after bowl. Before the air popper, I came from a strictly-stovetop family. All of this got me thinking: What is the best way to pop popcorn? Kenji has already shared his deep and undying love for the Whirley Pop, a simple, lightweight aluminum pan equipped with a handheld crank that keeps the kernels moving, coupled with a vented lid that battles steam-related sog. He tested the basic Whirley Pop against a high-end version and a stovetop method and found that the inexpensive Whirley Pop produced the lightest popcorn in the shortest amount of time. Because I couldn’t just take his word for it (and because I wanted an excuse to bring popcorn back into my life), I knew I had to do some popcorn testing of my own. Kenji’s findings were helpful, but I still had questions about other popping methods, and I needed them answered in order to truly get to the bottom of which popcorn method is best. Stovetop-popped with plenty of oil: This method was made popular by Chef Jessica Koslow of Sqirl in LA. She uses much more oil than traditional stovetop recipes, nearly frying the kernels. The abundant oil perfectly coats the popped kernels, allowing them to grab on tightly to your dry seasonings without any additional fat. Whirley Pop–popped: As described above, this inexpensive and lightweight aluminum pot heats up fast and comes equipped with a crank to keep the kernels heating evenly. Air-popped: Air poppers are countertop appliances that use only hot air to circulate the kernels and get them popping—it's the extreme opposite of Chef Koslow’s method. Microwave-popped: The method that’s so ubiquitous, you’d be hard-pressed to find a microwave without a "popcorn" button. Rather than using store-bought microwavable popcorn, of which there are too many varieties for me to have tested thoroughly here (though we did conduct a taste test back in 2010), I popped my own kernels in a plastic microwave-popcorn container. Team Light and Crispy preferred popcorn made in the Whirley Pop with just a touch of oil, which was fluffy and had a delicate and crisp texture that made it easy to shove handful after handful into your face. Team Rich and Crunchy was all about Chef Koslow’s fried-kernel method, which gave the fat-coated, glistening popcorn a dense and hearty crunch. Want to know more? Keep reading for all the crispy, crunchy, buttery deets. What Is Popcorn, and Why Does It Pop? Popcorn is one of several types of corn grown and harvested throughout the world. Although other varieties of corn, such as flint and dent, can pop into a crunchy puff, nothing becomes a fluffy snack quite like proper popping corn. This is due to its unique combination of a tough exterior, a densely packed and starchy interior, and 14 to 20% moisture by weight. Underneath the hull of any kernel of corn, regardless of type, are the corn germ and endosperm. Endosperm is the collection of mostly starch and some proteins that exists inside a seed. * It provides the nutrients and energy for germination. * Guess what? Corn is considered a seed, a grain, a vegetable, and a fruit! The endosperm in each variety of corn has a particular ratio of two different forms of starch—amylose and amylopectin—and protein. It’s this ratio that determines the qualities of the corn and, most importantly for our purposes, whether or not it’ll pop. Amylose is a molecule made up of a long and straight chain of sugars that easily pack into dense and tight configurations, while amylopectin molecules are branched and form weaker clusters. Because popcorn contains a high percentage of amylose relative to other types of corn, it is more densely packed and harder. When a kernel of popcorn is heated up, the moisture inside it quickly transforms to steam, exerting pressure on the seed from the inside out. Luckily, the tough outer hull is so strong that it can withstand forces up to seven times that of the atmosphere before bursting, giving the dense collection of starches inside plenty of time to soften and hydrate. Once the hull finally breaks, the tightly packed slurry of high-amylose starch and protein quickly expands due to the dramatic change in pressure, much like whipped cream being ejected out of a pressurized canister. The starch then immediately cools into the crisp, crunchy, and light foam that has us coming back for more. According to Harold McGee in On Food and Cooking, the ideal temperature for popping corn is around 380°F (190°C). What we need for the best results is a method that gets as many of the kernels as possible to that ideal temp, as evenly as possible. If the popcorn is unevenly heated, any kernels that pop early are likely to burn before the whole batch pops, while also leaving behind too many tooth-cracking un-popped or semi-popped suckers. Because the outer hull isn’t completely impermeable, timing is also of vital importance. Heating up the kernels too slowly can result in the moisture escaping, leaving behind a surplus of un-popped kernels; heating too quickly means the starch inside won't have a chance to hydrate, resulting in less fluffy popcorn. What’s the Best Way to Pop Popcorn? The best method of popping corn will evenly heat up the kernels, not too fast nor too slowly, while also allowing the developing steam to escape so the popcorn stays crisp and crunchy. Let’s see which method is most up to the task. I popped three batches of popcorn using each of the four methods. For the stovetop method, I added one-third of a cup of safflower oil, staying true to Chef Koslow’s style of starting out with more oil than kernels. In the Whirley Pop, I included two tablespoons of oil, for a more traditional ratio. The microwave and air-popped popcorn remained fat-free. For both the stovetop and the Whirley-Popped corn, I first preheated the oil over medium-high heat with just a couple kernels. Because popcorn acts as its own thermometer, once those test kernels popped, I knew the oil was at the ideal temperature. After removing the tester kernels, I poured in the rest of the corn. After I'd added the kernels, I kept them in motion over medium-high heat until the popping settled down to just one every 10 seconds. For the microwave popcorn, following the manufacturer’s instructions, I added the corn to the bowl and secured the vented lid. I popped the corn on high until the popping subsided to one kernel every 10 seconds. In our 900-watt microwave, this took about three minutes. The air popper works by circulating the un-popped kernels with hot air. Once the kernels pop, their increased surface area allows them to be easily blown through a chute by the air. I popped the corn in the air popper until the last kernels stopped popping, which took an average of six minutes per batch. The team blind-tasted the popcorn with no seasonings added, to avoid adding more variables to the mix. I also counted how many un-popped kernels remained in each batch. As soon as I saw the kernels bobbing around in a sea of oil, I was worried. But once they had fully popped, it turned out to be just the right amount of fat to coat each kernel. This method resulted in big, fluffy kernels, with a hearty and dense crunch that many tasters preferred. The popcorn popped with this method also stayed crunchy the longest, retaining its texture even the next day. This method also cuts out the extra step of buttering up your popped corn, which can often lead to soggy kernels. By popping in ghee or clarified butter, you can get the taste of butter in a popcorn that stays crunchy and is ready for a sprinkling of salt, plus an extra dried seasoning if you want. Whole butter contains both water, which will generate steam, and milk solids, which will burn at the high temperature required to pop corn. In ghee and clarified butter, both the water and the milk solids have been removed, so you get that buttery flavor without the unwanted steam or burning. The downside to this method is the dangerous amount of splatter that happens during popping. In order to prevent the popcorn from becoming soggy from the steam created during cooking, Chef Koslow keeps the lid slightly ajar throughout the process. But in my testing, I found that this provided an opening for hot fat to jet out, nearly taking out an eye in one instance. In an attempt to minimize oil splatter, I also tried this extra-fat method with a few adjustments. First, I popped the corn in the same pot, but fully covered with a grease splatter screen in place of the lid. This allowed all the steam to escape, leaving not a single soggy kernel, but it left me heavily speckled with oil burns. The oil made its way through the fine mesh of the splatter screen; it was just too much for even a splatter guard to contain. I next tried popping with plenty of oil in a Whirley Pop, which is equipped with a vented lid. Even with the full coverage offered by the Whirley Pop’s lid, just as much oil splattered through the vents as when I left the lid ajar on the pot. Together, the small vents in the lid of the Whirley Pop result in as much of an opening as a lid left ajar, not offering much more protection from oil splatter. I then took a cue from Iranian-style steamed rice, which calls for covering the lid with a damkoni to absorb excess moisture and prevent soggy rice. I wrapped the lid of the pot with a clean kitchen towel and kept the pot tightly closed during popping. The kitchen towel absorbs the moisture that develops as the popcorn pops, while allowing you to keep the lid safely shut. However, if you’re working over a gas stove, there is potential for the towel to catch on fire, so, as an added precaution, I used a big enough towel to allow me to tie up the corners over the lid. If you’re making popcorn using this hot-oil method, I've found that a clean kitchen towel is your best friend, regardless of whether you're popping in a pot or in a Whirley Pop. Wrapping the lid of a pot with a towel lets you keep it closed without making the kernels soggy, while securing a towel over a Whirley Pop can catch any oil that makes it past the vented lid. Either way, given the high potential of towels catching on fire or oil hitting your eyeballs, it’s safe to say that this method isn’t recommended for small children or popcorn-popping novices. The Whirley Pop popped the kernels the fastest, at just under two minutes, and left the fewest un-popped kernels behind. 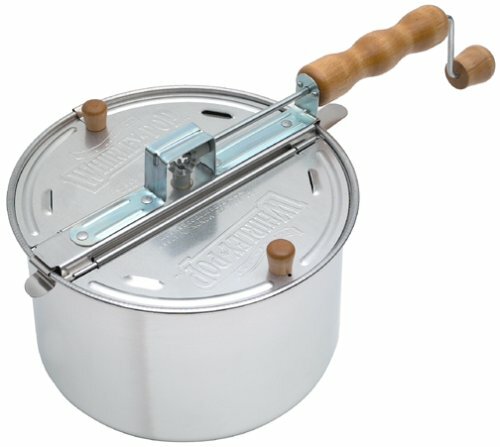 The thin aluminum bottom transferred heat quickly, while the hand crank kept the kernels moving for even and efficient heating. The vented lid allowed built-up steam to escape, without losing any popping kernels the way a lid left slightly ajar might. Apart from the great yield, this method made the lightest popcorn, with a crispy and fluffy texture reminiscent of great movie theater popcorn, and it was the favorite of many of the tasters. If you prefer your popcorn minimally buttered, this is the method for you. The number of un-popped and semi-popped kernels left behind with each method. Eating the stale and soggy air-popped popcorn was like snacking on Styrofoam peanuts. The popcorn was small and unevenly popped, rather than light and fluffy, with many un-popped and semi-popped kernels left behind. Even right out of the popper, the corn failed to taste crisp and crunchy, likely because the internal starches weren’t heated enough to fully hydrate and swell. The microwave made the tasters' least favorite popcorn. It tasted stale right out of the microwave, and only continued to shrivel up as it cooled. Not only did this method leave behind many un-popped kernels, the popcorn also easily burned if left in the microwave for just seconds too long. On the plus side, this method was easy and resulted in minimal cleanup, thanks to the dishwasher-safe container. Because it doesn't require plugging anything in or using the stovetop, this is a good method for kids to pop corn on their own or for use in dorm kitchens. For kicks, I also tried popping corn in the microwave bowl with the addition of two tablespoons of oil. This left just as many un-popped kernels, but the resulting popped corn tasted less stale and was fluffier. At the end of the day, I’ll take popcorn whatever way I can get it—stale, unsalted, even slightly under-popped. But I was surprised to see the great differences between the four methods. I’ve permanently put away my air popper and am now and forever a Whirley Pop believer. How much oil is added during popping is what will determine whether or not you end up with light and fluffy or dense and crunchy kernels. I’m on #teamlightandcrispy all the way. When it comes to popcorn, I want quantity, and the popcorn popped in the Whirley Pop was light enough for me to easily munch through a full batch. If you’re on #teamdenseandcrunchy, you may still want that Whirley Pop—you can use the lots-of-fat method in it (covering the Whirley Pop with a clean towel to avoid skin-searing pain) and still take advantage of the even heating offered by the hand crank for even better results. But definitely don’t take my word for it. Do some popcorn testing of your own, 'cause that’s what Serious Eaters do.